My busy Monday started with creating a name and logo for my design. I came up with Bloom. This relates to jellyfish which I used as inspiration and also a metaphor for plants and flowers being able to bloom due to the reduced levels of pollution. Here is the final logo and badge design. The colour used is Qing, also used in parts of my vehicle's exterior and interior. 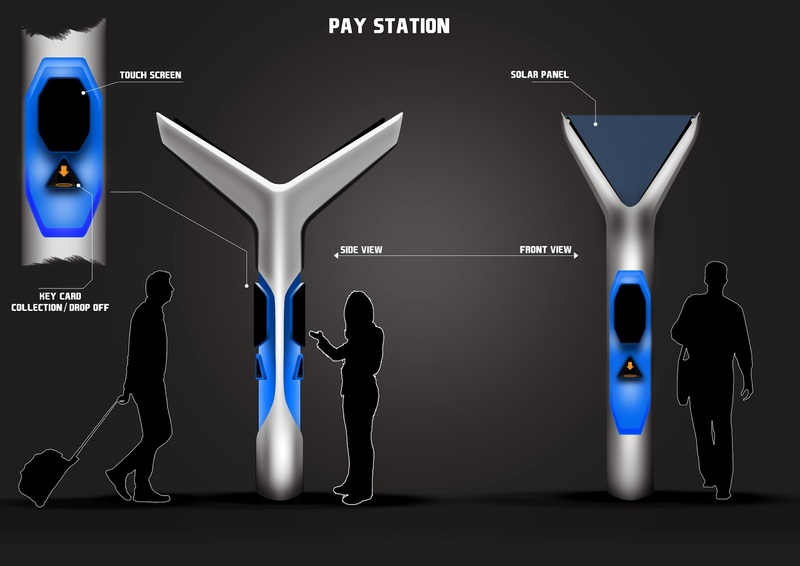 Finalised Pay Station design. It features four solar panels above which act as shelter in poor weather, brushed aluminium exterior with Qing coloured detailing. It has a large touchscreen and a collection booth for receiving and dropping off the vehicle's key card as well. Each Pay Station can serve two customers at once.